:hmpf: anyway new wall for you all. it woulda looked nicer but ill re vector it later. i like it, jus tad too simple for my liking :( but the sunset/sunrise looks good.. Very nice wall. It has one of those, peaceful deadly feelings to it... well disregarding that oxymoron, Everything in the background is well detailed, it and the character is pretty clean considering it isn't vectored. (I hate it when comps destroy all your work in one swift blow.) Your placement of the title for the wall is pretty nice and creative. Looks like a lit sign or something. Great work. Looks awesome^^ You integrated the eiffel tower scan into the wall extremely well and the composition looks great. really nice bg... i think your title misses a "u" at Movement... but you didn't forget it in the wall XP i like the colours of the sunset... it could almost look peaceful... if it weren't for girl pointing a gun at us loll good job! Very cool wall, great idea for the theme. I like the pic you used, and the bg goes very well with it. Nice job! It's just gorgeous! The colors all fit and the Tower looks brilliant! The sunset really is dazzling! I remember being on that bridge!!!!! yay!!!! I like this wall. good job with the sunset backdrop. Makes a nice demi-sillouette design. nice nice wall!!!! I love noir!!!! The bg is perfect....!!!!! ADD!!! That is probably the best setting I have seen for noir wallpaper. I looks really great. nice wallpaper, the background goes very well with the chara. Noir wallpaper... Cool, I love Noir so much :D.
I think you made very cool wallpaper. I like especially the concept ^_^. Beautiful wall!! It's really nice! I love the colour you chosed I think it fits her really well. And I just love the composition!! :D the placing for everything is great! The scan is good, and the details are great! 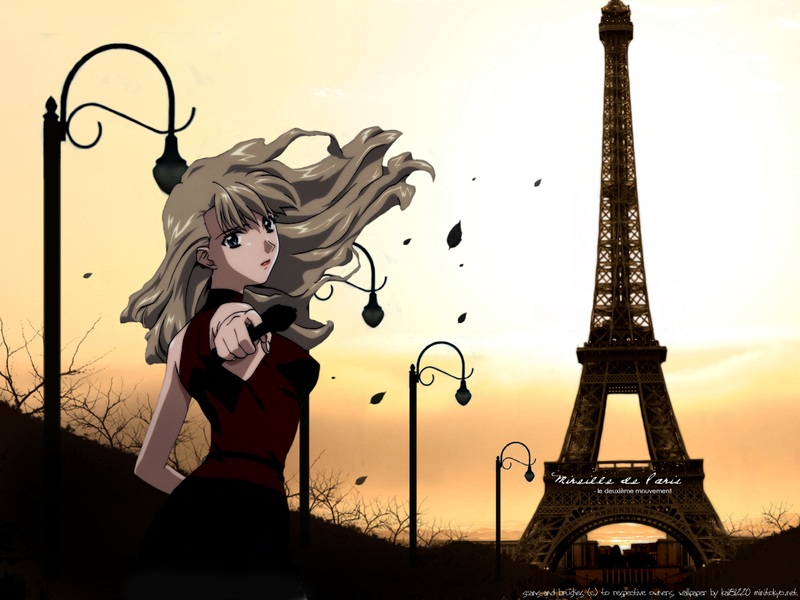 Great Job with the Background.I like the Idea with the Eifel-Tower in the Back. I add this wonderfull Work from you to my Favs. Amazing job, once again, Kai! the sunset is very soothing, i love it; though some clouds are a bit too blurred imo. neways, excellent wall you have here, kai. this is a wonderful atmosphere of paris. and mireille looks great! keep up the good work, kai! Nicely done tower. Fits in well with the sky and scenery. The scan extraction could use some work. Maybe some blending around the hair? A great concept. Great work. Keep it up! omg i love the background......its so pretty!...omigod i just love it but the girl is very pretty too! i never seen noir....i hear it is very good hotugh! but haha your hilarious! your lil outburst was so cute! i can't say i don't know what you went through....but thats another story for another day! anyway you really did do a great job on this wallpaper....just like all the others......lol.......yes well i'm goin to shut up now but anyawy thanks for the wallpaper! XP tootles! its a awsome wallie! the sky is so pretty against the dark surroundings! its so nice! +fav!